The service will be open to the public on Sunday making Mumbai the first Indian city to ever use such a transport facility. The much-awaited Mumbai monorail was inaugurated by Maharashtra's Chief Minister Prithviraj Chavan and Deputy Chief Minister Ajit Pawar on Saturday. The service will be open to the public on Sunday, making Mumbai the first Indian city to ever use such a transport facility. 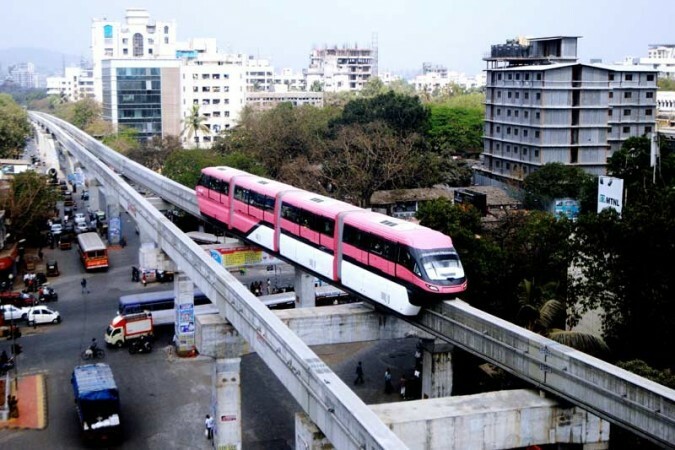 The monorail service that will link the city to major stations will begin its first phase of 8.93 km between Wadala and Chembur in the eastern fringes of the Commercial Capital. The second phase of the ₹3,000 crore monorail project that will be extended to Sant Gadge Maharaj Chawk in South Mumbai is expected to be operational by mid 2015. The first phase of the monorail will cover seven stations between Chembur and Wadala, whcih are Wadala depot, Mysore Colony, Bhakti Park, Bharat Petroleum, V.N. Purav Marg, Fertiliser Colony, and Chembur. The second phase (to be completed in 2015) will cover a distance of 11.2 km and will include the following 11 stations: Chinchpokli, Chembur Naka, Wadala Bridge, Mint Colony, Acharya Atra Nagar, Antop Hill, Wadala, GTB Nagar, Fertilizer Company and Bharat Petroleum. The fare will range between ₹5 to ₹19 depending on the distance. The rates are similar to those of the Mumbai local trains or buses but monorail will be a luxury ride in cheap rate. There will be no monthly passes like the ones on Mumbai's local trains but there will be a system of smart cards. In the beginning, the services will operate with four coaches. The entire rail will be able to carry about 2,500 passengers (each car will accommodate 568 commuters) and they will arrive in stations at an interval of 15 minutes or four trains in an hour. For the initial weeks, the timing will be 7:00 a.m to 3:00 pm. It will later be changed to 5:00 am till midnight. The monorails will travel in an average speed of 65 kilometers per hour and will have a maximum speed of 80 kilometers per hour. It is expected to reduce the travel time between Wadala and Chembur by almost half. It takes 40 minutes at present but the monorail will take only about 21 minutes. The #Mumbai monorail will be practical,efficient,green,fast & very comfortable to travel in. Here's to less traffic & shorter commute times!